I guess I really wasn't kidding that I am on the once-a-month blogging track. It wouldn't pain me so much if there weren't so many things I wish I could write about, but my days are full not only of food but of little humans and plenty of learning. Keeping a whole foods kitchen, preparing almost all we eat from scratch takes time - more time than I previously realized. When you start out on such a journey and then just keep adding and building, towering ever upward, pretty soon you can start to feel like our ancestors likely did: spending most of your time and energy finding and preparing food. While I've cut back on the ferments, there are still plenty of things to plan ahead for. And while still on the path of economic recovery, humble things tend to take the center of our plates. I treat meat like most other non-American cultures, as a condiment rather than a "deck-of cards" portion served alongside traditional side dish vegetables and starches. Years ago I overdid it on the green salad making (having one a day sometimes 2 for more than a year...) and I can barely make a green salad now to save my soul. If you make me a green salad, I'll happily eat it - but otherwise I get my greens sauteed or added to something baked. What then to make for dinner? So often I feel frustrated that my older son is still as picky as he is, and he recently added eggs to the list of things he doesn't currently like. Sometimes I feel just plain worn out considering what to cook around here. 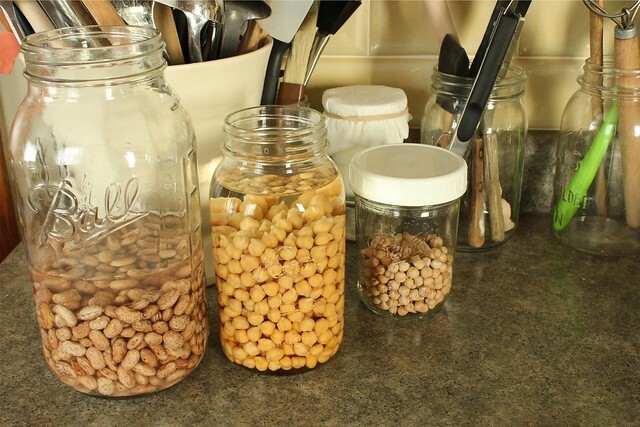 Beans are usually my answer when I feel like the pantry is looking bare except for jars and jars of miscellaneous grains, nuts, and seeds, and we don't feel like pulling a whole chicken from the freezer. Beans are probably the one thing I can get every family member to eat simultaneously and without fuss. Just about any bean makes my list too. Bulk Kidney, Navy, Pinto, Black, and Great Northern, rare stashed Tepary or meaty Good Mother Stellards or handfuls of long cooking legumes like garbanzo beans often push their way into my cooking life by default. I justify the cost of eating less meat by buying mostly organic beans and legumes. If I keep a sharp eye, my co-op will sell almost all of the standard varieties on sale 5 lbs. at a time, at some point during the year. I collect my beans carefully, choosing them wisely, tenderly bringing them home, and housing them in quart canning jars. Dried beans keep a remarkable long time. I feel like I have an ace in the hole having a whole shelf of them to choose from. I have cooked beans all matter of ways. I have soaked them 12 hours and then carefully cooked them in a barely simmering pot of water without salt. I have taken them off the shelf, rinsed them, and pressure cooked them for 20 minutes which wasn't enough and then re-pressure cooked them for longer. I've put them unsoaked in a pot of water and cooked them for hours and hours and still ended up with chalky insides. I've put them in a crock-pot and hoped for the best, frustrated that it took the day and I still had mealy beans. I now swear by brining beans. Emma Christensen wrote the article that I most refer to based on and endlessly tested Cook's Illustrated method and some solid science by food scientist Harold McGee. It's titled "Think Salt is the Enemy of Perfect Beans? Think Again." I think again every single time I make any type of bean or garbanzo bean (which should be properly titled garbanzo legume). I've referred so much to that article that it nearly comes up automatically when I begin to type brine into my search engine. For some reason, I can't remember the ratio of salt to water, of water to bean quantity. Oh well. It's good to know the Internet exists - and good to know people like my Mom who say things to me like, "well, about how much salt? I'm not going to measure, that's too much monkeying around." The morning I want beans for dinner (and we're early risers over here), hopefully 7-8 hours before, I throw a half pound of dried beans with a spoonful of kosher salt in a half gallon canning jar and fill it with water enough to cover by several inches. I'll stir it well with a chopstick. And I'll admire it on my counter for the bulk of the day. 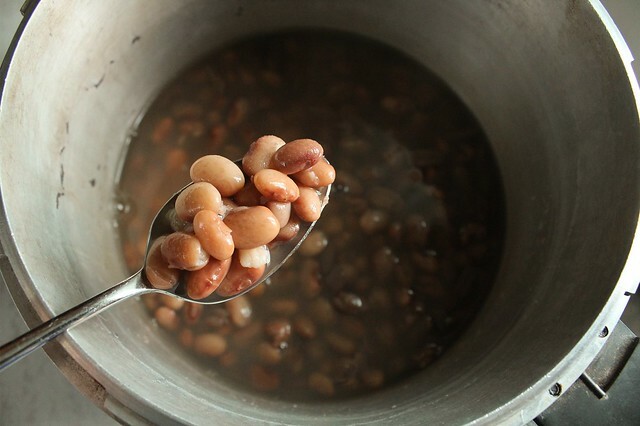 This works particularly well with pinto beans destined for refried beans. After the brine, I rinse them well and add them to a pressure pot. I add another small spoonful of kosher salt and just enough water to cover by about 1 inch and lock on the lid. I bring it up to pressure over high heat, and when the gauge starts to rattle, I turn it down to medium and time it for exactly 4 minutes. Then I remove it from the heat and let the pressure come back naturally (without the quick-release method of running the pressure pot under the faucet). Perfect beans. Every single time. In 4 minutes. ...and 8 hours of beforehand thought. My pot is old and secondhand, I try not to worry that it's aluminum since my beans are barely in it. The 4 minute pressure rule is my standard for most brined beans. I've tried it with different types of white beans, black beans, and red beans. Every once in a while, they will be too soft or need to be cooked some more - but those occurrences are pretty rare. Garbanzos get a slightly different treatment. I soak them 8-12 hours, actually I aim for 24 hours if I'm thinking that far ahead, and I give them the same brining as the other types of beans. When I go to cook them, (I rinse them well and) I add in a 1 t. of baking soda per pound of beans. If I pressure pot them, I start with 8 minutes, then let the pressure come down naturally and check them. But this week, I decided with just a half pound to cook them on the stovetop. It took barely an hour for perfect beans, creamy still composed pebbles that would work well in a salad (or getting picked up gingerly by a baby), mashed for felafel, or blended completely smooth for hummus. Alton Brown is where I got the baking soda idea. I make my hummus somewhat like he does, but I always like to add in cumin powder and some cayenne. I also use my bean cooking water to help blend it. Being thoroughly soaked and drained, I don't find any "digestive" issues from using the cooking water, and I figure there is more flavor. I've come to think of most of my raw ingredients as good friends. I'm not much of a meal planner, and I exploit their different attributes as I'm considering our dinner hours. I'm getting better at thinking ahead for meals, especially since I'm not able to grocery shop on a whim anymore, and often I'll cook twice as many beans as I need and freeze a half pound in their cooking liquid to further help me swiftly pull supper out of my sleeve. Even with dried beans, I feel like they make a quick meal. I feel savvy that I don't shell out for canned beans which don't often taste the best and are really quite expensive by comparison... not to mention they don't often sit well in the belly either. 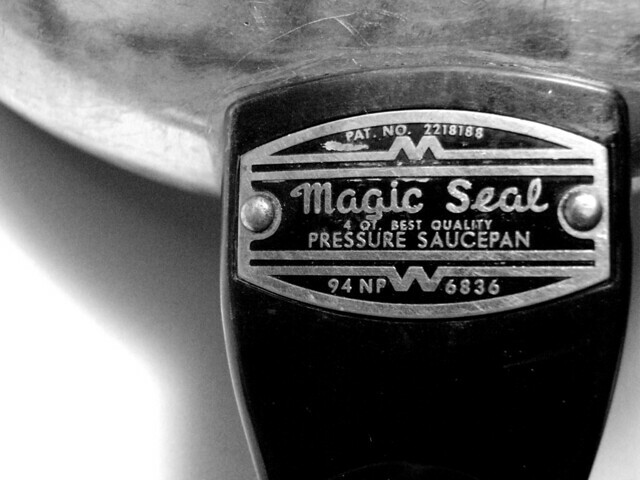 Do you have a pressure pot? Do you use it to get quick dinners on the table? Please share! Tags: Emma Christensen, beans, brining beans, cooking beans, garbanzo beans, pinto beans, planning ahead.